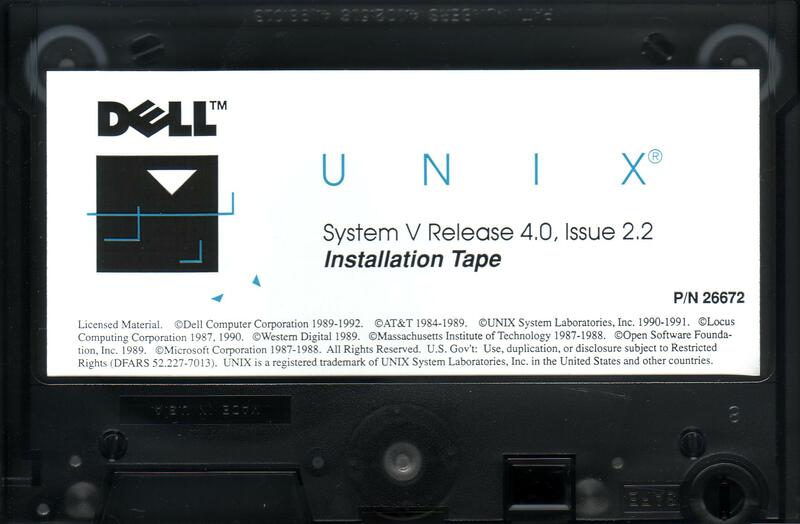 Author tenoxPosted on March 20, 2012 October 12, 2018 Categories bochs, DELL Unix, guest post, i386, qemu, SYSV, unix, virtual networking, VirtualBox64 Comments on Dell UNIX Lives Again! After years of chasing this thing, and being so late to the party, I’ve done it. It’s 2am and I’m exhausted. vi isn’t there, but elvis is; I’ve left the building. Author neozeedPosted on December 7, 2010 July 6, 2013 Categories 386BSD, bochs8 Comments on 386BSD 0.0 boots! However this time I noticed that if you keep on rebooting, it’ll actually stop complaining and work! So not only was I able to recover from a crash after trying to install the source code, but I was able to complete the install, and install the patchkits! 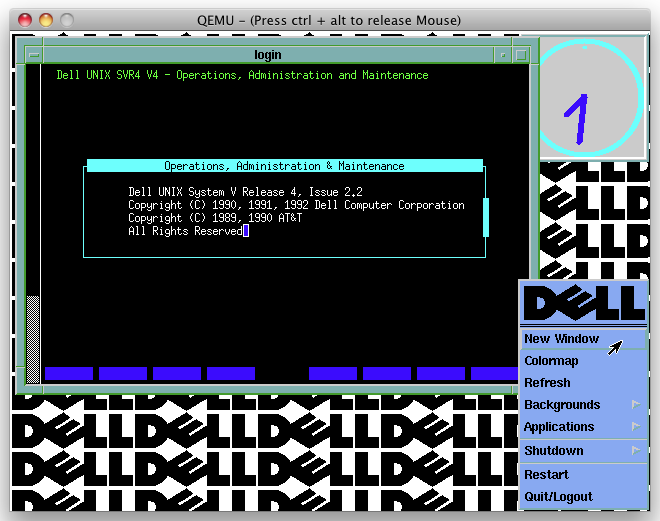 What this has resulted in, is that Qemu can now run 386BSD!!! And it’s significantly faster then Bochs. Not to mention you gain the whole SLiRP / Usermode networking. So far I’ve tested this with Qemu-0.11.0 just fine. I’m not sure about other levels… so it’s another YMMV. Oh yeah, and another f2c build, and yes it’ll run Dungeon! 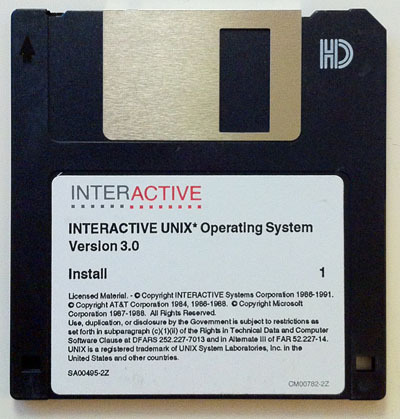 So for the few people interested in some BSD history, as this is the ‘first’ Net/2 derived freely available release in a qemu format right here (sorry, link removed, if you want it install this instead). 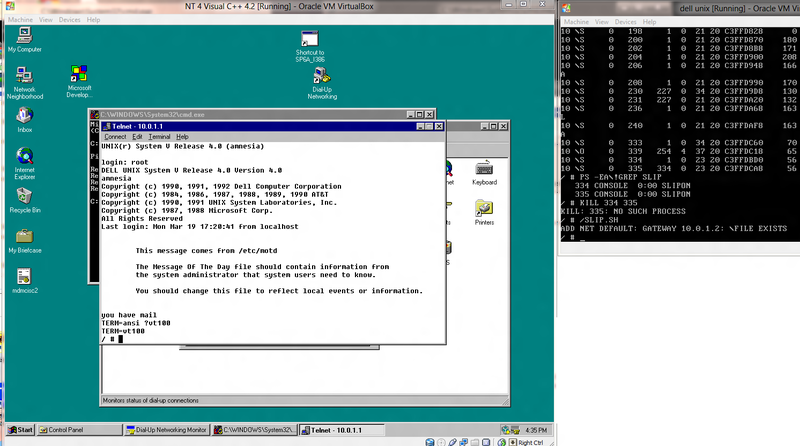 And with any luck, you’ll find the VM booting, and all set and ready to roll. 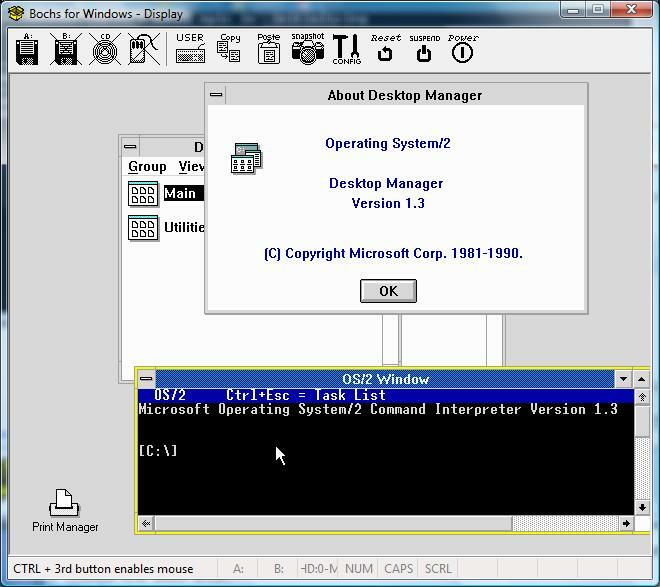 If it comes up in single user-mode, just close Qemu & fire it up again..
I’ll probably put together a windows install package for this later, but for now I figure I’ll unleash some 386BSD onto the world. 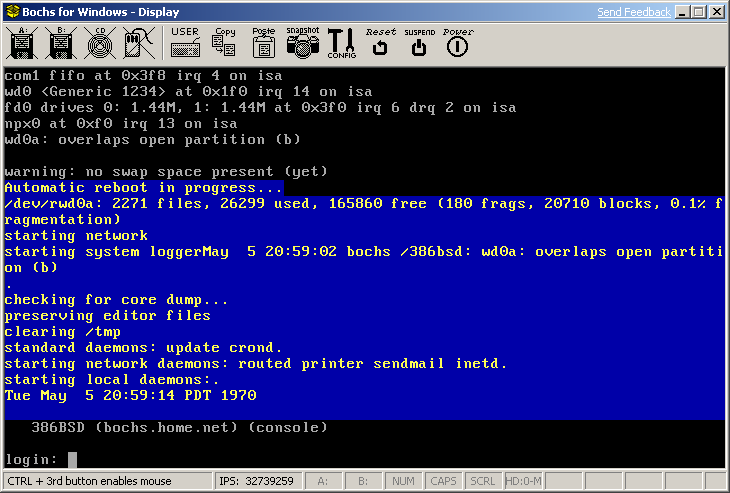 While checking around on wikipedia for something related to 4.2BSD, I found out that bochs 2.4 can run 386BSD! 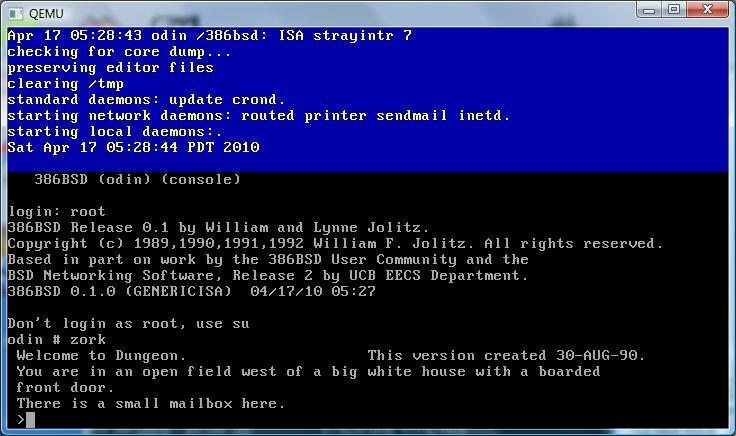 Now the significance of 386BSD is that it was the real first time that BSD had been given to the masses, in that it *could* run on commodity hardware (read 386’s! ), come with full source code and be free.  It is no wonder that the initial 0.0 release had well over 100,000 downloads! 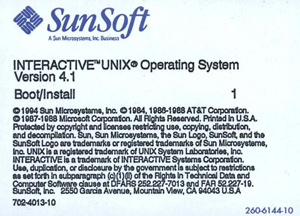 It is getting harder and harder to track down a download source for 386BSD as it too was swept up in the great lawsuit of AT&T vs BSDI/CSRG although it was never named in the suit. 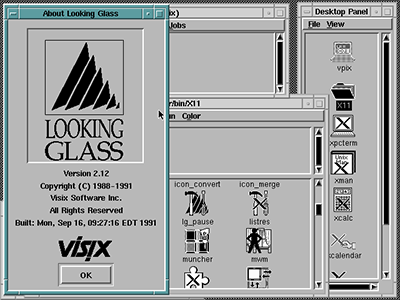 Not to mention it was quickly superseded by the FreeBSD & NetBSD projects. It is very unstable in the 0.1 release, there is clearly some issues with it’s “install” program with regards to allocating swap space, and in general with the OS’s swapping routines. Also because of the overlap any attempt to install on a disk larger then 100MB results in a corrupted file system that will no longer boot after the eventual file corruption. It’s quite sad, but if you search the news group at the time, there was all kinds of issues with the install process, and with it’s stability. The installation process does involve quite a bit of floppy shuffling, and will almost result in lots of trial & error to get it going. While there is an install guide on the install disk, it isn’t worded into exactly how to do it. Needless to say the Free/Net BSD releases have improved on the install greatly. On the other hand it sure is interesting to see a Net/2 BSD to see how far we have come, and how so much is the same. 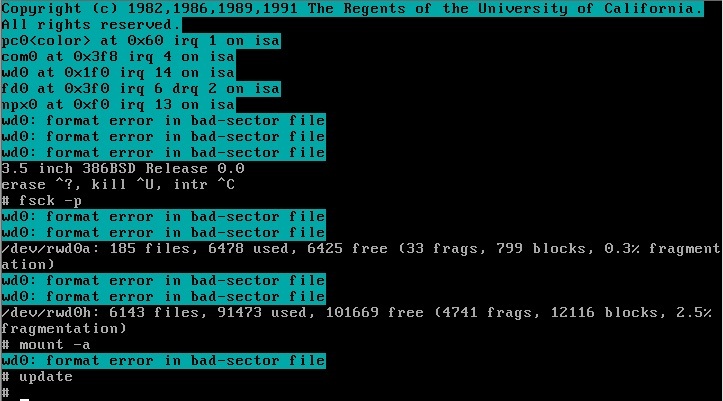 You can find 386BSD on the mirror site oldlinux.org. 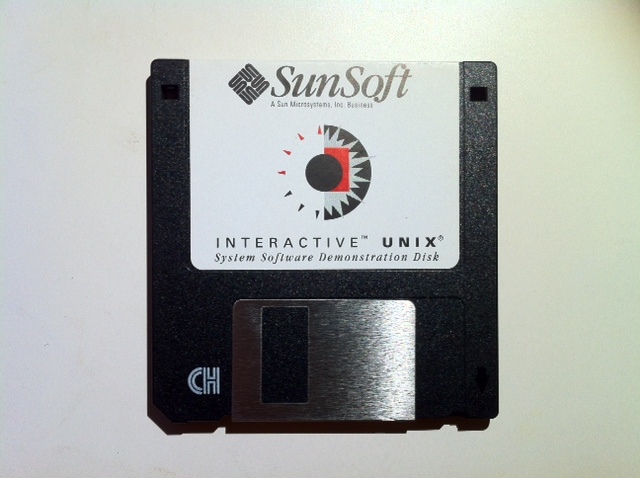 Just watch out that the install floppy (dist.fs) is only 1.2MB.. So be sure to alter your bochsrc file accordingly.